William was born in 1892, the only son of George James Gregory and his wife Jane née Evans. The family was completed by his three sisters: Ida Frances Battin (born 1886), Florence Mary (1880), and Violet Gladys (1896). His father, George, was a grocer by trade, first as an assistant then as manager at a Newbury grocery store; then in 1901 he went into partnership with Harry Tombs and took over a store at 99 Bartholomew Street in Newbury trading as Tombs & Gregory, bacon curers and grocers. It is possible that, when they took over the shop previously operating as Seward Bros, they were taking over from their former employer, though they could as easily have been working for one of the many other Newbury grocers. Prior to taking over the Bartholomew Street shop, the family lived at 3 Dorchester Villas, now 27 Gloucester Road. The shop came with its own accommodation so the Gregorys moved in, together with a lodger - George’s partner, Harry Tombs. Young William went to the Newbury National School; National Schools were established by a Church of England group, the National Society for Promoting Religious Education. The National School attended by William would become St Nicolas School in Enborne Road (more recently relocated to Link Road). His schooling would have ended when he was 14, after which he would need to find employment. It seems that he went into his father’s trade, perhaps in the family business, but before long he was in Bognor, Sussex, where he was working as a grocer’s clerk at the time of the 1911 census and went on to become the manager of a substantial Bognor business. However, in 1914 he decided on a change of career - perhaps he was simply bored of the grocery business, but whatever the reason he decided to enlist in the army. According to his entry in Soldiers who died in the Great War he was recruited in Sutton, a small Cambridgeshire village about 15 miles east of Huntingdon; what he was doing there is a mystery. He enlisted very shortly before the declaration of war on 4 August 1914 into the Duke of Wellington’s (West Riding) Regiment and would initially have joined their depot/training battalion. However, the arrival of war and the sudden influx of recruits that it brought led to the creation of new battalions of the so-called ‘service’ battalions of the ‘Kitchener’ armies. The first such battalion created by the Duke of Wellington’s was their 8th (Service) Battalion. It seems that recent recruits like William were included along with the new wartime recruits. 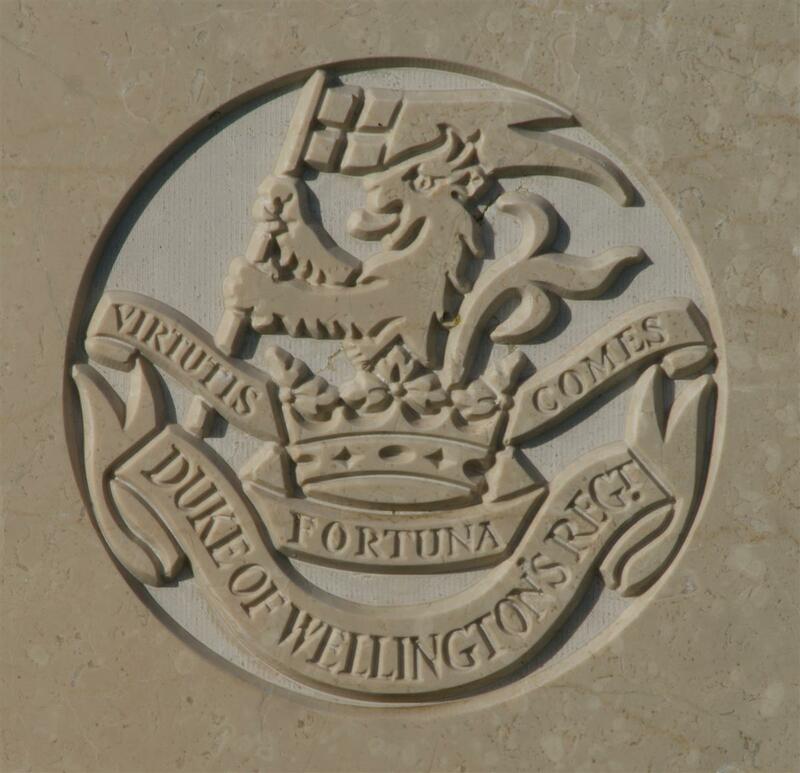 The regimental badge of the Duke of Wellington's (West Riding) Regiment, as used on CWGC headstones. The battalion was formed in Halifax but soon moved to Belton Park near Grantham, Lincolnshire where it trained as a part of the 34th Brigade, 11th (Northern) Division. In January 1915 the battalion transferred to the 32nd Brigade in the same Division. The Division moved to Witley (in Surrey, near Aldershot) in April 1915 and sailed from Liverpool in July bound for the Dardanelles where it landed at Suvla Bay 7 August 1915. The first two battalions of 32 Brigade landed the previous evening under fire, but the 8th Duke of Wellington’s landed unopposed. 10/8/15 In reserve, in action at noon. Losses few. GREGORY – Killed in action at the Dardanelles, Lance-Corporal W G Gregory, 8th Duke of Wellington’s Regiment, only son of Mr G Gregory, Bartholomew-street, Newbury, aged 22. As announced in our obituary column of last week, Lance-Corpl W G Gregory, only son of Mr G Gregory, Bartholomew-street, has been killed in action at the Dardanelles. Born and bred in the town and educated at the National School, he was well-known. His kindly disposition earned him many friends, and his success at games won him fame in sporting circles. Hockey, football, swimming, and music, were his favourite pastimes, and he excelled in all of them. For three and a half years he was in business at Bognor, finally gaining the position as manager of the office of a large grocery establishment there. Before the month of August last year he had joined the 8th Duke of Wellington’s Regiment, and for nearly 10 months was stationed at Grantham, Lincs. After a short stay at Witney [sic] Camp, near Aldershot, the regiment left for the Dardanelles, where they arrived about the first of August. An official announcement of his untimely death was received on 3rd of September, the day on which he fell being between August 4th and 10th. Mr Gregory has also three cousins serving with the colours. William was buried in Chocolate Hill No 3 Cemetery in grave I.7. After the war this cemetery was closed and the bodies moved to Green Hill Cemetery, where William’s remains lie today in grave II.G.14. 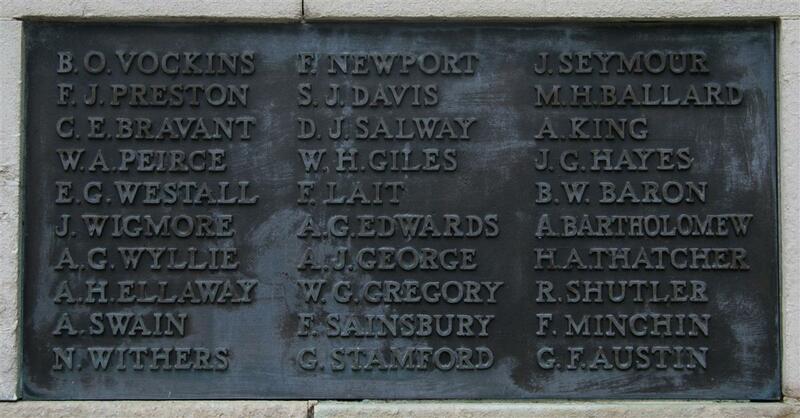 Locally William is remembered on tablet 4 of the Newbury Town War Memorial. His family also added his name to a stone on his mother's grave in Newtown Road Cemetery.